The brown long-eared bat is one of the most common of our nine recorded bat species and is found all over Ireland. As night falls, these remarkable little mammals emerge from their daytime roosts to feed on a wide variety of nocturnal insects. As the name implies, long-eared bats have strikingly long ears… almost ¾ of the length of their bodies. When resting the ears are folded or curled and held backwards, sometimes hidden behind the animal’s wings. Adult long-eared bats are between 4.5 and 5.3 cm (1.75 and 2 inches) long, have a wingspan of 24-28 cm (9.5-11 inches) and weigh between 5 and 12 g (0.2 and 0.4 of an ounce). They have long, soft, grey-brown fur that fades to a lighter grey on the belly. The face is a pink-brown and the broad wing membranes are a dark grey-brown in colour. 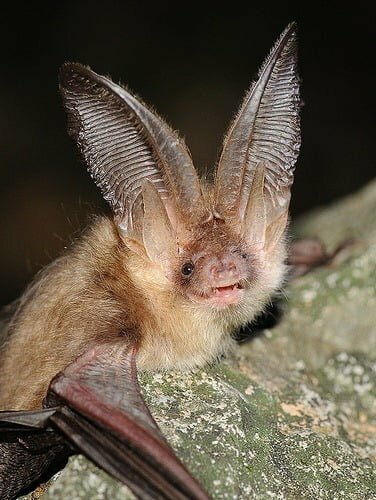 Like all other Irish bats, the long eared bat uses echolocation to navigate the night skies and to detect its insect prey. It emits a burst of very high frequency calls and interprets the echoes that bounce back to build up a very accurate representation of its surroundings. These calls are beyond the limit of human hearing, but can be detected by a bat-detector. Using a bat-detector bat species can be identified in the field by the unique characteristics of their echolocation calls. Long eared bats emit calls of between 25 and 50 kHz, however this bat’s calls are considerably quieter than those of other bats, which accounts for the overdeveloped ears and has earned the species the nickname of “the whispering bat”. As well as hunting by echolocation, the long eared bat uses its incredibly acute hearing to home in the noises made by its invertebrate prey. Its broad wings allow it to fly slowly through the foliage with incredible manoeuvrability. Although it takes insects on the wing, it is also a gleaner, plucking insects and spiders from foliage and even off the ground. Smaller prey items are eaten in the air, but large insects will often be taken to a favourite perch. These perches are easily identified by the heap of insect remains on the floor below. Mating takes place in the autumn but fertilisation is delayed until the following spring. Around October long eared bats move from their communal summer roosts in tree-hollows, attics, old buildings and bat-boxes to hibernate in more secluded, colder locations like old mines, caves, tunnels and cellars. In April and May they emerge and form maternity roosts of typically between 10 and 50 females. Unlike many other bat species males are often present in these maternity roosts. A single baby is born around the middle of June. Young bats can fly after about three weeks and are fully independent at six weeks of age. Despite being common and widespread long-eared bats face substantial threats. Their habit of flying close to the ground makes them vulnerable to attack from nocturnal predators, particularly domestic cats allowed to roam after dark. Roost sights are also vulnerable: old hollow trees are often felled as “unsafe” or “unsightly”, while remedial work on old buildings, bridges and tunnels can render them useless to bats. Treating roof timbers with chemical sprays can wipe out an entire roost, and leave the attic space lethal to bats for up to twenty years. Widespread use of pesticides is also having a detrimental impact on bat populations, severely depleting the availability of insect prey and introducing toxins into the food chain that quickly build up to lethal levels in the bats. All Irish bats are protected under the 1976 Wildlife Act. It is illegal to handle or otherwise disturb or interfere with bats or their roosts.